The year 1988 was alternately a dreadful and a splendiferous year for ST gamers. Things were lookin' a mite bleak for a while—we had to contend with the likes of Test Drive and its ilk while impatiently awaiting the messianic arrival of Dungeon Master. DM was everything we could have hoped for; not just a game, but a world, an experience. And it changed forever the rules and everyone's expectations. How could software developers possibly compete with DM's shadow lurking over their shoulders? Most of them couldn't, and didn't try. Except Argonaut Software (released in the U.S. by Rainbird). Enter Sarglider II, late in '88. And how fortunate we are to have received two incredible games in one year. 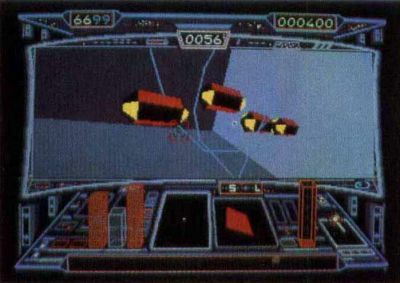 At first, Starglider II seems "merely" another vector-graphic 3-D-motion-simulating shoot-'em-up, rather like the underrated Arctic Fox. And it is. 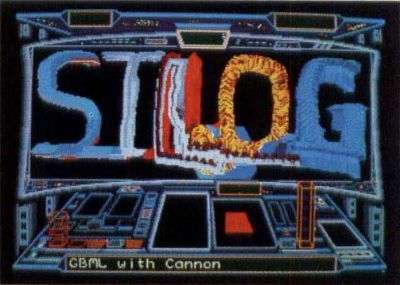 However, after a few games it becomes clear that Starglider II is much more: a multilayered quest game in which blasting aliens is actually secondary and largely unnecessary. Eventually, you're forced to ignore the spectacularly rendered enemy forces and concentrate solely on planet-hopping, searching for Neuron Bomb components from around the Solice Star System. As each component is found, it's as rewarding an experience as slaughtering your first purple worm or figuring out how to get the babel fish. Well, maybe not quite as rewarding as getting the babel fish. $$$ written and amusing novella by Ken Follett, who's up on his Douglas Adams, details the cliché but still enjoyable Star War-derived scenario. You are Jaysan, a reluctant hero pilot from the Novenia Star System who has infiltrated the nearby Solice System because the Egrons (BAD GUYS) are constructing a Death-star-like Space Station; its guns are trained on your home planet. So much for not getting involved. Within virtually no time, you must find the only man who can construct a weapon powerful enough to vaporize the Space Station (no mean feat), Professor Halsen Taymar, locate all the materials to build this Neutron Bomb (scattered on planets and moons throughout the system), hold the enemy forces at bay while it's constructed and ultimately deliver the nuke to the Egron Space Station as a going-away present. Sound easy? It is, actually—it's just tricky as heck. The Egron Space Station and its accompanying projector bases (on the moons of the red-giant planet Mill-way) are constructed at a frightening rate, imbuing the adventure with a nerve wracking, adrenaline-pumping frenetic atmosphere. There's also the additional urgency of your ship's iminent power drain. Shields, lasers and engines all sap precious power. Estimate your vessel's energy status incorrectly, and you may run out of juice in deep space, far from any refueling sites. You can never get too comfortable in this game; there's always some pressing need that's of more importance than the task you've just completed. Trying to figure out what to do, where to go and in what order is half the game's fun and strategy. Any way you play it, Starglider II's amazing graphics, sound and even a built-in drawing program make this more than a winner—it's a classic. Topping everything off is the finest animation I've ever seen on any home system. The updating is so incredibly swift that you can believe this universe really exists. The animation is almost twice as fast as Arctic Fox's, although the terrain isn't as varied. Up to 24 frame movements exist on each object or ship, not counting P.O.V. rotations, zooms or perspective changes. That means you can fly under, around and through things, and see them depicted accurately in even the most extreme angles as they move You are there. Rainbird has given us an entire solar system with seemingly real physical space to explore. Warning: Do Not Read Unless You Want the Game Spelled Out for You. You begin on Apogee, one of the Solice System's five planets, surrounded by hordes of vitriolic Egrons. It may be quite some time before you survive longer than a minute or two, since flying your craft, the Icarus, takes some getting used to and the BAD GUYS are particularly nasty here. Your best bet is to disobey the documentation and ditch the mouse. Icarus is quite impossible to control by mouse. Save it for point-and-click games, like Dungeon Master and ChronoQuest. Not just a few games have been rendered unplayable (Tanglewood, for one) because their designers opted for mouse-control on what should've been a joystick game. Fortunately, Starglider II gives you the choice. My nine-year-old Atari VCS stick, veteran of entirely too much 2600, Colecovision and C-64 abuse, worked perfectly. Set your cross-hair autocenter to "X" and avoid the other options, and you'll be flying fine. While Apogee is a good training ground, your best bet is to vamoose, pronto, before a stray shot takes out one of the all-important power lines. If you're a fledgling pilot, dive directly into the underground tunnel network. Here you'll find another graphic miracle—and the game's only glitch—blast doors disappear momentarily as you pass them. No big deal. Map this network carefully! There are dead ends, deserted depots and miles of circles to get lost in. (Incidentally, tunnelflying is a bit easier when you toggle to Icarus' outside view—just behind, and looking past, your ship. Press "Enter." Another wonder.) When you find the depot, write down its coordinates and what they tell you to retrieve, then haul your carcass into space and get searching. If you've done all this already, a trip to the depot isn't necessary until you've rounded up three of the components needed for The Bomb's construction. Head immediately for Castron, one of Apogee's moons. Before we get to Castron, one word about the solar system: decoys. There are many wondrous places to visit in the Solice System, both above ground and below, and for fun's sake it's pleasant to buzz them and enjoy the marvelous animation of each planet's indigenous creatures. However, to finish the game, you never have to visit and should probably avoid the following places: Vista, Q-Beta, Esprit, Wackfunk Depot, Enos, Westmere Depot, Millway and, of course, the sun. Wackfunk Depot provides staggeringly insignificant ship repairs in return for goods; Esprit will supposedly give you a case of Nuclear Fuel in exchange for your pilot couch. Alas, the only way to surrender your seat is by running out of energy while in the depot, thereby destroying your ship. Not a good thing to do. You'll just have to get the Nuclear Fuel someplace else. And though one does have to tight-orbit Millway to find Egron ducks and whales (required by other depots to trade for Bomb components), flying too close will immolate your ship. 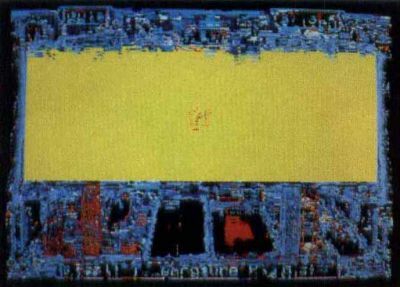 Similarly, Solice is useful only for the LSD-inspired graphics it provides as you die a colorful, melting death (Figure 1). Supposedly, you can recharge Icarus' systems via a close flyby, but I've yet to pull this maneuver off. Recharging is also (supposedly) possible by sitting on one of Dante's volcano's lips, but all that's yielded me has been a lava-ly demise. Stick to asteroids and power lines for juicing up. And avoid unnecessary jaunts to worthless planets. Castron is a useful place, and you'll have to go there a few times before you finish the game. Castron has it all: an extensive array of efficient power lines (buzz them immediately upon planetfall), mineral rock scattered about the surface (tractor-beam it aboard) and, hidden deep in the tunnels, the indisputably handy bouncing bombs (Figure 2). You can pretty much dispense with what they're trading at the depots. The wine and Castrobars can be obtained for much less trouble by raiding the Pirate Ships (more on this momentarily). Get four bouncers and skedaddle. Don't worry about using them up, because each time you return to Castron they'll be restocked. And don't forget to map the tunnels! It's about time to deal with the moons of Millway, your main source of trade and blistering warfare. Its seven moons are uniformly inhospitable and, worse, have no available power sources. That means each trip to a moon requires a stop at the asteroid field between Apogee and Millway. Asteroid Methane Fragmentation Refueling (wherein you catch an asteroid in your tractor beam and siphon its rotational energy) is thankfully easy, but be careful: Linger too long, and pirates will come to party. They'll steal whatever goods you're carrying if you don't expeditiously engage them. Also, be careful not to stop anywhere but at the edges of the asteroid field. Heaven help you if you're anywhere near the middle. . . .
All of these components can be found on various planets, also. By now, one, probably two projector bases have been erected on Millway's moons. Time to try out one of those bouncing baby bombs! After a pitstop at the asteroid field, bolt over to the nearest projectored moon (Broadway, most likely) and park just above and behind the projector base. Don't waste gas lasers (or missiles, if you've gotten them yet) on any part of the base, including the Sentinel; just drop a bouncer, sit back and savor the stupendous graphics feast (and the additional 8,000 points you've added to your score). If you're not on Broadway, go there now. Fly and map the tunnels; this is important, since all Millway's moons share the same tunnel layout. At the depot you'll be informed that the dear, insane Professor isn't in (yikes!). He's out cruising the planet in his beautifully rendered Emma 2 jet-car enjoying the fabulous graphics! Capturing him requires the trickiest flying you'll ever have to do. At first, catching the zigzagging vehicle seems impossible. It blazes along at three-quarters of your top speed in an entirely erratic, drunken fashion. Try chasing him, and ground-based cannons will make brie out of Icarus before you can say Caspar Weinberger. You can eliminate a few with F&F missiles, but... if you'll notice, the Prof. has a penchant for a particular strip of moon between the two tunnel entrances! Park near one and wait for him. You'll be shielded from the shells, and he'll eventually whiz right past you! (See Figure 3.) Floor it after him, tractor him in and save the game quickly so you won't have to do this again. Nabbing the Prof. will also give you one of his inventions: the Time-Warp Cuboid launcher. It clones whatever it hits, projecting it forward one second in time; this has the effect of making objects collide with and destroy themselves. Only trouble is, it doesn't work. Well, even geniuses have their failings. Stick to lasers and missiles for effective results. Back to Apogee with your booty. You'll probably need another sojourn at your friendly neighborhood asteroid field. On Apogee, charge to full with the power-line stunt if you need to, then submerge. 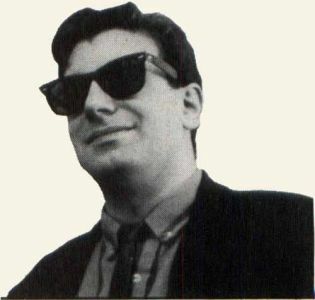 The Prof, will begin working on The Bomb, leaving you to cope with the new projector bases that've no doubt been built. Before we mulch another projector base, an easy jaunt: Blast off for Millway, stopping just on the asteroid field's brink (on the Apogee side). Beam-in an asteroid and await the pirates. After a scalding space battle, you should have tractored aboard their dropped cargo: Castrobars and Vistan Wine. Zip back to Apogee and bless the depot with three more items from their wish-list. Mineral rock can also be obtained from the Pirates. Now we can drop by a Millway moon for some projector mashing. After this bit of fun, you can pretty much choose your priorities. Use the chart to find the remaining components and their moons, and obtain the items in whatever order you see fit. As I mentioned earlier, whales and ducks can be found in the Millwayan atmosphere. They're needed to obtain the Flat Diamond and Cluster of Nodules. Pyramids can be found on most planets (including Apogee), as can Egron Mini Rockets. Gather up another load of stuff and convey it to the Prof. Right around here you'll receive a message on your Mini-Screen: "Bomb Completed." How is this possible without all the key elements? On Apogee, you'll discover the answer. If you attempt to collect The Bomb without fulfilling the depot's list, The Bomb itself will punish you severely. Leave it there along with the favors you bring, and set out for the last item: the case of Nuclear Fuel. Where in tarnation is it? Aldos. And it's a long way off. First, it might pay to venture to Castron for some bouncers and the power lines. On the way to Aldos, it's probably a good idea to remind the enemy just how dazzling the animation is when a bomb annihilates one of their projectors. Aldos is heavily fortified, but by now this should be a cake-walk for an experienced pilot like yourself. Scoop up an Egron Mini-Rocket if you haven't already, and reconnoiter the terrain. Notice those odd striations every now and again? Hover near one for a bit and watch what happens. If you're lucky, you'll discover the purpose they serve. Try to tractorbeam the fuel up. No go, but the picture should be clearer by now. 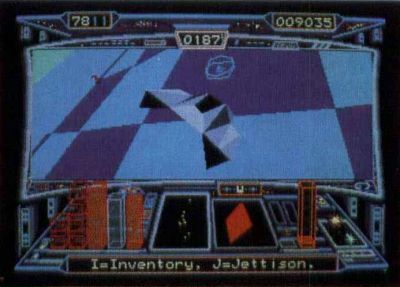 A well-placed F&F missile will extricate the mine guarding the fuel, or you may be able to swipe it before the Egrons tap into it, locking it into the grid (Figure 4). Hopefully, you've enough power to get back to the asteroid field and refuel. However, don't return to Apogee just yet. Unfortunately, The Bomb is very unstable; even slight changes in atmospheric pressure can detonate it (such as entering or exiting a tunnel network; odd that reentry and breakaway don't affect it). Get The Bomb later. You've got some wanton destruction to take care of first. Zoom to Q-Beta's "moon" (really a 3-D projection), where you'll see the Space Station surrounded by its seven Sentinels. 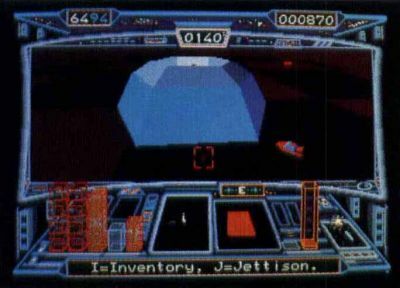 To finish the game, you need to destroy all the Sentinels, all the projector bases and pick up The Bomb and wing back to Q-Beta to deliver it, Federal Distress, to the baddies. You won't be allowed to launch the bomb if even one of the bases is operational. So for now, dispatch four F&F missiles to knock out some Sentinels. These, happily, will not be rebuilt. Off to Millway's moons. Hopefully, you've got at least three bouncing bombs remaining; if not, you'll need to visit Castron at least two more times. One last trip to a Millway moon depot is in order—replenish those missiles. To save time, do this before you start moon-hopping and wiping out projectors. Once you've dismantled as many projectors as possible, time becomes of the essence. You must vault over to Castron (more bouncers), pick up The Bomb (and recharge) on Apogee, destroy four more Millway projectors and get back to Q-Beta before more than one projector is rebuilt. Have a bowl of Wheaties and get crackin'. Now they let you collect The Bomb. Things go much more smoothly when you listen to people, no? Be careful exiting Apogee's tunnels—fly too fast and you're grits. From this point on, any potential source of collision must be avoided. That Bomb's just too dang sensitive, swinging away under the Icarus in its "forslook" containment harness. (Click on the outside view for a good peek at this.) Whatever you do, don't brave the asteroid field! A quick round of projector-mulching later, you should be on your way toward your destiny. Use the forslook! Quickly now, wipe out the remaining Sentinels with the F&F's, target the Space Station and feed the baby his nuke-burger! KAAA-BLOOOEY! Congrats, young Luke, er, Jaysan, you've wiped the Egron scourge from the galaxy...for now. Horror sets in as you realize that this hasn't really stopped the Egrons at all—they're already rebuilding their projectors—and a new, more powerful Space Station is under way. And for those of you who like the bad guys to win, wait around and watch the Space Station. You'll soon receive these messages on your Mini-Screen: "Space Station Arming Main Guns," "Space Station Firing Main Guns" (it unleashes hundreds of blue energy spheres at your home planet, Novenia) and "Satellites Report: Novenia Destroyed." Bah. Much more fun to fry the heathen enemy scum! One great thing about this game is that there are myriad strategies for winning. If you like, you can stall the Space Station's construction by bombing a projector every few minutes, and just play for the score, wiping out vast quantities of Egron forces. Any way you play it, Starglider II's amazing graphics, sound and even a built-in drawing program (Figure 5) make this program more than a winner—it's a classic. Kudos to all the designers: Jez San, Richard Clucas, Alister Perrott, Paul Gomm, Chris Humphries, Pete Warnes, Tim Watson and Adrian Friday. And to all the other software designers on this planet: Best of luck topping this one, guys. Jim Cirile is a New York-based screenwriter and film director whose first feature, Banned, will be released about the time you read this. When not shackled to his 1040, Jim also plays bass in the rock band Export, draws, paints and complains quite a bit.